NASA's Hubble Space Telescope, which launched aboard the space shuttle Discovery on April 24, 1990, is shown here in an astronaut photo. Just three decades ago, scientists didn't know how old the universe was, that supermassive black holes lurk at the hearts of galaxies or that you could directly image planets around other stars. NASA's Hubble Space Telescope changed all that. Hubble launched on April 24, 1990, and 25 years later the telescope still contributes greatly to astronomy and astrophysics. The panelists were Priya Natarajan, a professor of physics and astronomy at Yale University; Hubble Mission Office head Ken Sembach, of the Space Telescope Science Institute (STSci) in Baltimore, which operates the telescope's science program; Sara Seager, a planetary scientist at the Massachusetts Institute of Technology; and physicist and Nobel laureate Adam Reiss, of The Johns Hopkins University and STScI. Ira Flatow, host of the "Science Friday" radio program, moderated the discussion. Hubble has been in service a long time, and NASA engineers are always drawing up contigency plans to deal with things that could go wrong, Sembach said. But there's a lot of redundancy built in to Hubble's systems, he added, and the telescope could keep going for another five or six years — and possibly even longer. "It's a very robust observatory," Sembach said. That said, the JWST will eventually supplant Hubble. The new space telescope will have better resolution than Hubble, because it has a larger light-collecting area; JWST's primary mirror is 21.3 feet (6.5 meters) wide, compared with 7.9 feet (2.4 m) for Hubble's mirror. The JWST will also see deeper into infrared wavelengths, which are difficult to observe from Earth. "Hubble can only see that on large, puffy planets," Seager said. Hubble's observations weren't tuned to see gases that might indicate alien life. The JWST will be. "We are looking for gases that don't belong," Seager said. Oxygen is one of those, because it reacts so easily with everything else. "Without plants and photosynthetic bacteria, we'd have basically no oxygen," she added. Could aliens see us? With telescopes similar to the JWST — or perhaps a bit more advanced — hypothetical alien civilizations could get a read on our atmosphere, too, Seager said. "They would see our oxygen and ask their Ira [Flatow] about it," she said. Despite its age, Hubble — a joint project of NASA and the European Space Agency — is still doing great science in a number of areas. One such field is the study of black holes, Reiss said. "Hubble provides some of the best evidence for the existence of black holes," he said. For example, Hubble showed that supermassive black holes containing millions or billions of times the mass of the sun lurk at the heart of most, if not all, galaxies — including our own Milky Way. Astronomers think that massive stars produce much smaller stellar-mass black holes when they die, and they're using Hubble to seek these objects out. Researchers are looking for stars that seem to just disappear, because shortly after they explode as supernovas, a black hole would form, and no light could escape, Reiss said. "Only Hubble can do that," he said. Because Hubble can see distant galaxies, it gave scientists an idea of how fast the universe was expanding at different times in the past. It was the revelation that the expansion rate changed over time that altered our perception of the universe, by showing that dark energy existed. The JWST will do great science, and some its work will follow in Hubble's footsteps, Sembach said. "It has some specific things to look at that Hubble opened up the universe to," he said. The panelists also took questions from the audience. One person asked why Hubble matters, given the problems that exist on Earth. The panelists agreed that it's important for the United States to showcase its technical prowess and invest in basic science. 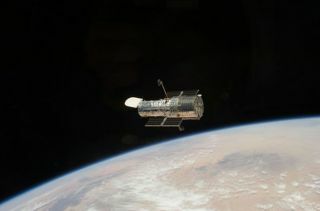 Natarajan, however, added that Hubble has also brought the wonders of the universe closer for people all over the world. "I also see that the universe is for all of us to explore, and Hubble is really instrumental for that," she said. "When everything is dreary in the world, it gives a sense of awe and wonder."